While recess appointments have long been used by presidents to at least temporarily fill federal positions, they attract the most attention when they are used to install a nominee who might be otherwise blocked by the Senate. One such politically-charged case is before the Supreme Court today and it could result in sharply curtailing recess appointments in the future. The case is reaching the high court at a time when President Obama has been locked in a bitter fight with Senate Republicans over his nominees, particularly his choices for the judiciary. But while appointments have been a contentious issue during his administration, Obama has resorted to the recess appointment at a far lesser pace than the four presidents before him. So far, Obama has made recess appointments 32 times, according to a Feb. 2013 analysis by the Congressional Research Service. 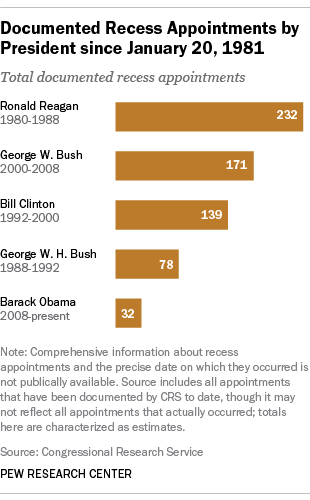 Among the last four presidents, Ronald Reagan made the most recess appointments (232), followed by George W. Bush (171), Bill Clinton (139) and George H.W. Bush (78), who served only one term. These include not only ones made between sessions of Congress, but ones during recesses within a session. The case being argued at the high court stems from three recess appointments President Obama made in 2012 to the National Labor Relations Board —the kind of action that Republicans were trying to forestall by holding brief pro forma sessions during a long holiday break. When the NLRB ruled against a Washington state company in a labor dispute, the company sued, saying the recess appointments were improper. When George W. Bush was president, Senate Democrats tried to use the same tactic of holding pro forma sessions in an effort to prevent use of recess appointments. Bush had made several controversial recess appointments, prompting Senate Majority Leader Harry Reid to schedule pro forma sessions in 2007 to try and head off possible recess appointments during the two-week Thanksgiving break in 2007.